Looking at this map (click on it to view a larger image), it would be easy to believe the country was fairly evenly split between Federalist and Anti-Federalist views. 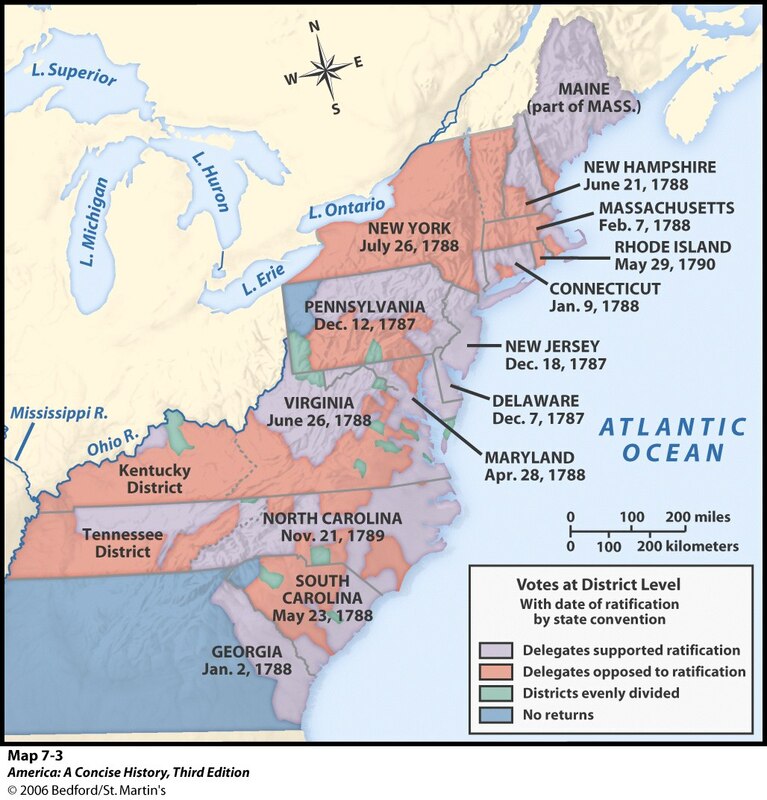 In fact, geographically, it would almost appear the Federalists were outnumbered. So it would be natural to expect the breakout of delegates to be similar. ie. a fairly even number of Federalist and Anti-Federalist delegates with them being clustered somewhat geographically. It is somewhat surprising then to see this distribution much more lopsided and with no obvious geographic clustering of delegates. The interactive map below shows far more delegates with Federalist views and both the Federalist and Anti-Federalist are fairly evenly spread throughout the nation. It would appear the Federalists invited just enough Anti-Federalists to help them work out the major points of contention before the new Constitution hit the streets. While confusing at first, this begins to make a bit more sense when it is discovered just how mobile this population was. Many of these delegates were men of means and they or their parents came to America looking for new opportunity. As such, many of the delegates were both willing and capable of relocating as they sought their own fortunes. Add to that the massive displacement due to the recent war and you get a population whose views are set primarily by their experiences and not just the areas they currently lived in and represented.